The young woman Lucina has a nervous breakdown and wakes up at an Asylum to find herself confused and scared. She is told that she has been transferred to the Pleasant Hill Asylum to receive special treatment from the acknowledged Dr. Specter. But Lucina refuses to believe all that she is told by the asylum staff and as she discovers more about the hospital and its patients, things aren’t what they seem to be. 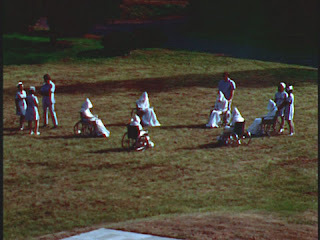 The dark asylum has a strange atmosphere over it and all of the patients are dressed in white hooded robes, and the few patients that talks to Lucinda only tells her to obey the asylum rules. It’s easier that way. Soon Lucina starts to have nightmares and visions of horrible things. When Lucina finally meets Dr. Specter, he informs her that she has had a breakdown and has to be confined to the hospital under supervision. 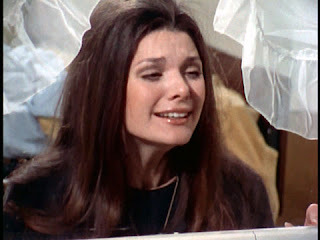 As her treatment continues, Lucina’s fian cée, Chris, comes to visit her, but he is met by the good Doctor himself who informs him that the asylum does not have visiting hours. Furious, Chris drives down to the local Police station to get help to get his fiancée out of the asylum. 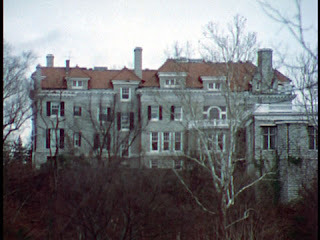 As Chris drives off, Lucina watches him from a window, and it becomes painfully clear that she is trapped inside the asylum. And soon more and more horrible things are taking place at Pleasant Hill, and it seems as some terrifying evil is lurking at the asylum. Asylum of Satan is a strange, creepy , cheesy and atmospheric film from maverick director William Girdler (Abby, Three on a Meathook, Day of the Animals) that works pretty well as an entertaining little shocker. 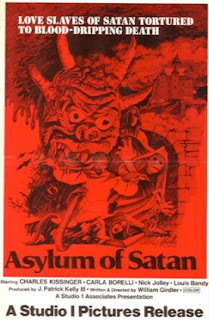 Made at a time when films about the devil where extremely popular by the p ublic, Asylum of Satan is a little unknown gem. The acting in the film is ok at best, Carla Borelli does a pretty decent job as Lucina, and Charles Kissinger is menacing and disturbing as he portrays both the evil doctor and the demented nurse Martine. The music is a fine mixture of creepy, brooding music to upbeat 70s rock witch fits great into the movie. The lighting in the film is one of the things t hat help it to become more than just a cheesy horror film, as most of the shots are nicely lit and helps to create tension and mood in the more sinister scenes. The special effects are pretty lame, even by the standards of the 70s, but that’s one of the things that make this film so much fun and charming. One of the most noticeable thing with the movie is the brooding, eerie atmosphere that’s present throughout most of the film; witch gives it a quirky and eerie touch. So if you manage to look away from the cheesy effects and the stale acting, this film has more than a few really moody and creepy scenes up its sleeve. 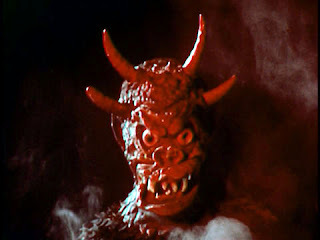 Asylum of Satan is a perfect film for any dark and stormy night, either you’re in mood for some devil worshiping, an atmospheric horror film or just plain ol’ cheese!